Autumn is always a busy and emotional time of year at Sandbeck as this is the season when the foals leave their mums and depart for their new adventures. The foals are now all growing, changing colour and learning to be more confident away from mum. We feel very privileged to witness these little furry bundles of joy and follow their journey from birth through to them leaving us. This year was no different to any other. Most foals were born in our maternity unit, which has CCTV, enabling us to watch them through the night (yes, I mean all night!). Others choose to be born on the garden, which doubles as a paddock, at various times during the day. Little Ginny Weasley was born right outside the kitchen window just as we were about to have coffee…..great timing! Luckily every foal was born without any complications and all of them were up suckling within a short while apart from Dumbledore who took a little longer but we mentioned him last time. This weekend saw 23 sets of little hooves trimmed. Our poor farrier asked if we had the telephone number of a good physiotherapist!! Over the summer we also microchipped all the foals with the help of a fantastic team from Rase Vets. The countdown to them leaving begins now and I’m not going to lie, many a tear is shed when we say goodbye and we always say to new owners that any photos, updates and stories are very welcome. We love to see them living and enjoying new adventures whether it be showing, driving, riding or simply enjoying life at home with their new family. As for the rest of the herd, the mares, geldings and stallions are starting to grow a winter coat in preparation for the dropping temperatures. We are adding a little hay into the field just to supplement their diet and our son Charlie is getting a dab hand at jumping on and off the tractor to help our hay man distribute the bales around the farm. The CCTV is set and connected to the house so the family can watch maternity at night …… it can be a very long night when the mares are restless and we have many…… ‘this is it’ moments. For them to change their minds and get up and start eating hay again!!!!! Charlie (11) helped one of the mums foal out in the field at tea time one evening last week. He said it was ‘a little messy’ but he was fine and helped the little colt follow his mum into a stable. Olivia (15) assisted little Dumbledore latch on to mum…. He wasn’t really getting it at first and it took him a while but he finally got it!! Well done kids! The team have been avidly grooming the ponies and pulling out the remains of any spring coat as Sandbeck has been hit by a mini heatwave. Around 20 ponies are all wormed, feet trimmed and groomed at the same time., it takes a couple of weeks to get through the whole herd. 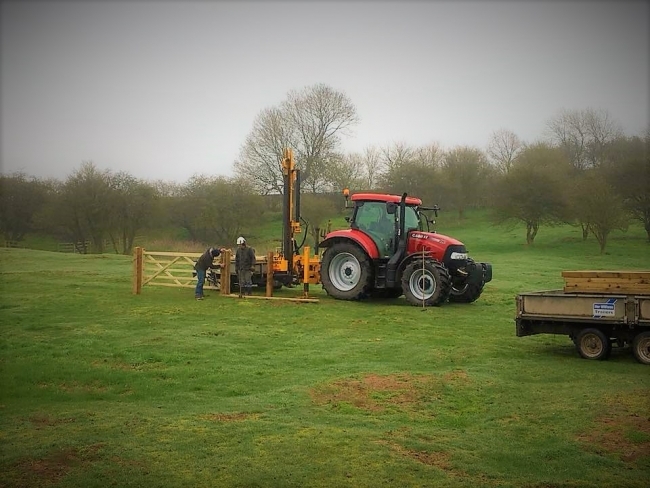 Sandbeck has added two more larger paddocks to the farm….. which always makes life a little easier for moving the ponies around and who was it who said “You can never have too many paddocks” or was that shoes? ……. Well it works for us anyway  We’ve also added another two sets of gates to give us more holding areas ……. pretty handy when ponies are leaving the next day (or travelling abroad in the middle of the night) it’s convenient to have them close by. Two weeks early, but fighting fit and absolutely beautiful, Sandbeck Huckleberry Finn arrived on the 23 April and is our first foal to be born this year. A stunning Piebald colt, he is by Edern Baner out of Selspens Starlite and has already been out enjoying time in the paddock. We can’t wait for him to have some foal friends to play with! We have twenty-three mares still to foal and they are due from the start of May. Ten foals are already reserved, but keep an eye on our Foaling News and follow us on Facebook to be among the first to find out about our new arrivals. Foaling season is busy and tiring, with long nights up watching the mares, but so incredibly rewarding when we meet their gorgeous little ones. We monitor our pregnant mares 24 hours a day and have cameras in the stables to make sure we are there to help them should they need us. If you have a mare in foal, you can find our foaling advice, including what to keep in your ready-to-go birthing kit, available on our advice pages. We can’t wait to update you on our next arrival and wish you the best of luck if you are waiting for your own mares to foal. Sandbeck Farm's Brand New Blog..
With foaling season just around the corner, we’ve decided to start a monthly blog where you can keep up to date on all things Sandbeck, meet the ponies and find our tips and advice. Despite the weather not being very spring-like, our ponies are enjoying being out at grass, although they were happy to see the hay delivery arrive after Sandbeck was recently submerged in snow! Proving the hardy nature of their breed, they do very well living out with good natural shelter, plenty of grazing or hay and access to clean water. We look forward to bringing you behind the scenes with us through this blog and we hope that you enjoy it, remember to share it with any of your Shetland loving friends. All the best until next month.